Nothing really has changed since my last HC. I have had a couple of new visitors and met some new people. I also got my first bits of mail! My main doctor had finally come to talk to us and give us her thoughts on our plan of action. For now we are slowly backing off of treatment and monitoring me, to see if I can go home. We will reevaluate in a week after we have taken away one of my treatments, and weened off of IV antibiotics and onto orals. If I can remain stable like this I might be able to go home before my birthday, which is in 13 days. We still aren’t really sure of what’s going to happen. I had a nurse who had treated my like I was either dumb, or a five year old. I took my pills, she WATCHED me swallow them and then said “Okay, open your mouth, lemme see.” I said “are you being serious right now! ?” I was offended. Luckily, since then I haven’t really had any problems with nurses or RTs, which is pretty good and I’m content. I had mentioned in my last HC that this was my 5th room during this hospital stay. Well, they wanted to move me again today, and I said no. Especially since now, my room is all decorated. I have a blue, pink, purple and orange polka dotted comforter and pillow cases. One of the RTs got me a sock monkey pillow case and my dad bought me a nice and comfy pillow. 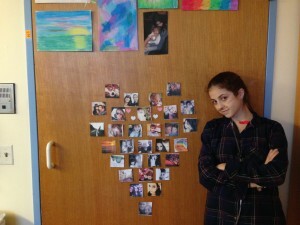 I also hung a ton of pictures on my door in the shape of a heart! 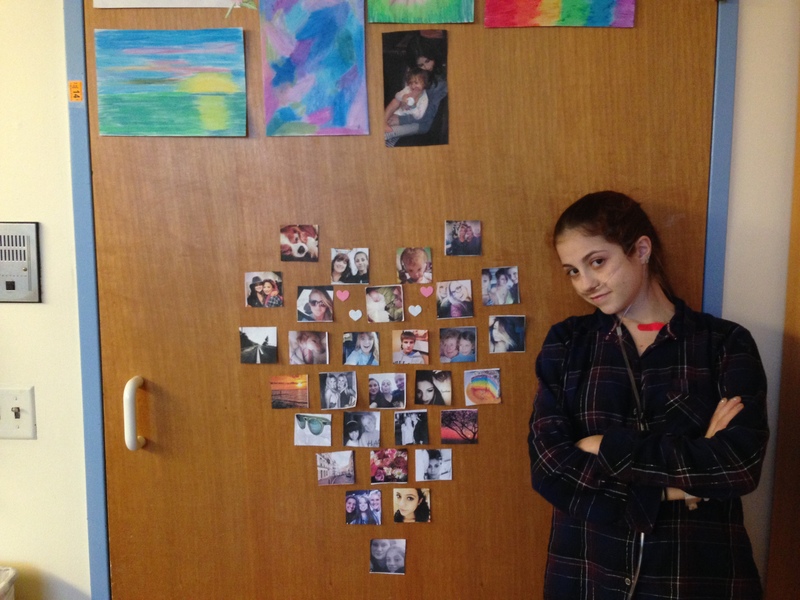 On the left is a picture that shows my heart of pictures and my closet that I put three pictures of Demi Lovato and one of Eva Markvoort. Tho it’s not in the picture, I later added “My Biggest Inspirations” above them. On the right is a closer look at the heart. Making that heart look like a heart that wasn’t too pointy or lopsided was very hard to do with these square pictures. The heart is filled with pictures of my friends, family, dogs and pretty nature pics like a sunset and a beach. My grandma helped me out with the layout. Yesterday my best friend came to visit me! I was so happy. (Pic on Twitter) I haven’t seen her in like two months. It’s crazy. Her mom came too. After they showed up Claire and I did a broadcast and I introduced her to all of my internet friends. Then my RT came in and it was treatment time. 🙁 So I suited up and started shaking. My dad came a little while later and brought me my first ever mail from my PO box! I filmed my “unboxing” or basically me opening them, and I will put it on YouTube once I edit it. I got a nice card from a man named Donald from North Carolina, and an awesome pink extendable back scratcher from a John and Laurie in Vancouver. It was pretty awesome and thoughtful! A couple of people told me that I should make an Amazon Wish List for my birthday that is coming up, so I decided I would. I put a couple of little things on there like phone cases and necklaces. A couple of days ago my RT came in and told me that there was a patient here that was reading my blog. I said that her mom could come in here and talk to me (I would have talked to her herself, but we are not allowed to interact with each other in person) if she wanted. She came in and she had said “So I was looking at your wish list…” and I was like “I literally just made that like two minutes ago. How did you see it already?” She also told me a lot about her daughter, and how she met Miley Cyrus and a bunch of other Disney stars. She even gave me this super adorable bracelet she made that has a pendant that says “Breathe” with a ribbon for the A. We added each other on Twitter and now we are “connected” lol. I also had a nurse come in and tell me that another patient had been reading my blog and found out I was basically his neighbor and wanted to know if I could iMessage with him. Of course I said yes. 11 Replies to "Hospital Chronicles: 5"
Hicks. I will be thinking of you and praying for you today and I’m sure I can speak for all Z-dumplings, we all send you love and good thoughts today. How could such an experienced investigator as Alex Jones possibly be oblivious to the role of Zionism in world corruption? How could he possibly believe that all of the world’s problems are coming from goyim? There is only one explanation for Alex Jones and his Zionist Denial: he is a Zionist, and his organization in Austin, Texas is a Zionist terrorist cell. power. our atoms get recycled yes, but that’s only one form of energy. The phenomenon of the pineal glad releasing chemicals at death, at least to me, demonstrates that something is leaving, something outside of the energy that drives your cells. No one would say a single cell, or even bacteria is actually conscious, nor atoms for that matter, yet we may agree that we humans demonstrate some kind of consciousness….and when I say soul I guess I am referring to the energies that drive conciousness, not the ATP that drives our cells. To JeffHey jeff that’s not GOD’s money cuz GOD doesn’t have any mone nor he wants the 10% of ur salary, all GOD wants according 2 what we have been thought is 2 get along with each other. churches, religions are nothing but a big business, and bsides if it would be the 10% it should be off /from what u have left after u pay all ur debts first, (2 the cesar what blongs 2 da cesar) another words pay ur debts first. Of course, the world is rioting and burning around you… but you must focus on the BC. Answer me this one question:If Barky resigned in the next 10 minutes, would you go back to sleep and say all is well our country is restored. HELL NO! Then stop believing it is the only thing going on. It is not the beginning, middle, or end… it is what woke the giant. Now that he is awake he is hungry for truth, he is unchained, he is SILENT NOW NO MORE! Read everything you can… especially what they don’t want you to read.